First in the field were deputy field director Paolo Del Vesco from Turin, our new bone expert from Leiden University, Sarah Schrader, and Lara Weiss from Leiden. We plan to renew our cooperation with Leiden University and soon again bring graduate students with us to Saqqara. 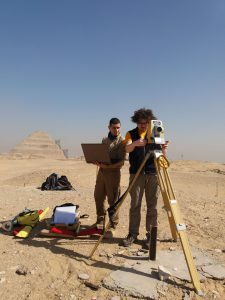 A second aim is to set up a research plan and hopefully to invite some PhD students to Saqqara soon. Leiden University Egyptologist Miriam Müller will also soon join the team for the same reason. In addition, two new surveyors of the ‘3D Survey Group’ of the Politecnico di Milanohave started to measure the previously excavated tombs; they will help us to measure and scan the results of the upcoming excavations (fig. 1). We are looking forward to an exciting season in which the new team hopes to gain a better understanding of the area to the north of the tomb of Maya. This is an area in which the ancient Egyptians built several small chapels in the Ramesside period, and where also later many activities took place. When cleaning the area where we stopped working in 2017 (fig. 2), we already found yet another embalmers’ cache, i.e. a pit used to bury mummification materials. Our most recent cache was found empty, its contents potentially burnt except for two linen bags probably filled with natron. The numerous embalmers’ caches in the area north of Maya’s tomb suggest a post-New Kingdom use of the area as a burial site. This could mean either reuse of existing New Kingdom and earlier tombs, as well as shallow pit burials next to those tombs – such as the body covered by a mat and bead net found by Maarten Raven in his area south of the tomb of Meryneith in 2017 (fig. 3). Sarah has now studied the bones and suggests that it was a young boy or girl of about 15 years of age, who suffered from bad nutrition and illnesses, and who had probably spent his or her life doing hard work, such as carrying heavy bags. We cannot determine whether it is a boy or girl, since the typical female features of the pelvis are not yet identifiable at that young age. On Saturday we expect to begin with the excavations of the Coptic occupation layer we discovered in 2017, this year supported by household archaeology specialist Miriam Müller. Stay tuned. Francesco Fassi and Alessandro Mandelli taking measurements of the excavation field, using our brand new total station. The excavations have just started! This year it remained uncertain until the last moment whether the Leiden-Turin excavations in Saqqara would continue. At the very last moment, the team got permission from the Egyptian authorities. The excavations can now start on 25 March 2018. 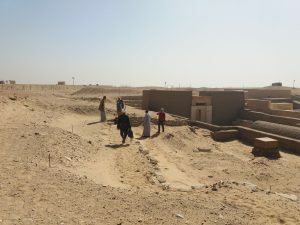 This year the team will be working on the New Kingdom cemetery, north of the tomb of Maya and Merit, where two small Ramesside chapels were found in 2017. Field directors of the Dutch-Italian research project are Dr Lara Weiss (curator at the National Museum of Antiquities, Leiden) and Dr Christian Greco (director of the Museo Egizio, Turin).